Canadian Foreign Minister Chrystia Freeland is back in Washington, D.C., on Wednesday for more meetings. NAFTA talks are picking up again but a deal is unlikely to be reached this week, four people familiar with talks told Bloomberg -- increasing the odds the latest deadline will be missed amid Donald Trump’s threat to freeze Canada out. 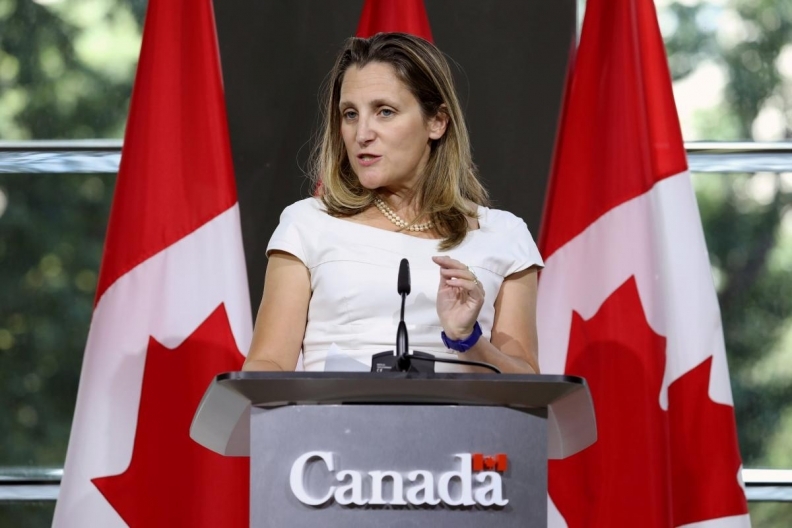 U.S. Trade Representative Robert Lighthizer and Canadian Foreign Minister Chrystia Freeland were expected to meet Wednesday in Washington, their first in-person session in eight days. The two countries remain at odds on core issues, including dairy and dispute panels. A deal is unlikely this week without major movement, the people said, speaking on condition of anonymity as negotiations continue. The talks could extend into next week, and several deadlines have been missed so far. A Canadian official had said Thursday was the likely deadline to reach a deal in order to convert it to legal text by the end of the month. The countries have been pressuring each other on the eve of the meeting. U.S. Rep. Steve Scalise, R-La., warned in a statement Tuesday that congressional patience with Canada was wearing thin. Prime Minister Justin Trudeau, at the same time, continues to say he would rather see no deal reached than be forced to accept a bad one. A preliminary trade deal was reached with Mexico in August. Barring an accord with Canada, Trump has threatened to proceed with only Mexico, though Scalise stopped short of saying Congress would go along with that. Scalise, the House majority whip, said if Canada does not “cooperate” then Congress would “consider options about how best to move forward,” though he didn’t specify how. There have also been numerous calls in the U.S. to include Canada. In a joint letter dated Monday, three major U.S. business groups -- the U.S. Chamber of Commerce, the Business Roundtable and the National Association of Manufacturers -- said it would be “unacceptable to sideline Canada,” the top buyer of U.S. goods. Prominent members of Congress have also said that Canada should be part of any new North American trade agreement. “I think that if all three countries are in and all signed up, there’s a much higher likelihood this gets passed,” Bruce Heyman, a former U.S. ambassador to Canada under Barack Obama, said Tuesday on BNN Bloomberg television. There’s no sign a Mexico-only deal can be passed by Congress, he said, while shrugging off the significance of Scalise’s statement. “I think Steve Scalise is carrying water for USTR,” he said. Canadian officials are warning that they’re prepared to see the next deadline pass if they don’t get an agreement they can live with, according to two people familiar with the talks. The Canadians need effective dispute settlement provisions in anti-dumping cases, and certainty to avoid misuse of national security investigations, under which Trump has applied tariffs, one of the people said. Sticking points in talks include dairy, where the U.S., facing a supply glut, is seeking a bigger cut of Canada’s protected market. In exchange, Canada is hoping to preserve some form of anti-dumping panels contained in Chapter 19 of the North American Free Trade Agreement, and an exemption for Canadian cultural industries. Other American demands include longer intellectual property and pharmaceutical patent protection and a higher threshold for duty-free shipments across the U.S.-Canada border, none of which the Canadians have signaled are deal-breakers. It’s unclear what will happen if it becomes impossible to publish text of a deal by Sept. 30. The countries could extend talks, but that means Mexico’s president-elect, Andres Manuel Lopez Obrador -- who takes office Dec. 1 -- will have to be the one to sign the new agreement. Trump could try to proceed with Mexico only, but will face blowback from Congress, and the actual U.S.-Mexico agreement would probably require further changes, Hillman said, because it’s written in a way -- for example, a requirement that 75 percent of auto content be sourced within the trade pact’s member nations -- that appears to presume Canadian involvement. “You wouldn’t want to leave that number at 75 percent if Canada is not included,” because automakers couldn’t meet it, she added. The president has threatened auto tariffs on the Trudeau government if it balks at a deal. Finally, Trump could use another pressure tactic: give six months’ notice of quitting the existing NAFTA. Heyman said he was concerned that could happen.